When Mario Manningham signed with the 49ers in 2012, the former Giants standout was going to provide a much-needed boost to a receiving corps that was woefully thin by the time the Niners reached the NFC Championship Game the season before. In 2012, the Niners brought on Manningham and veteran Randy Moss, plus selected wide receiver A.J. Jenkins in the first round of the draft. The signings, however, didn’t make enormous impacts. Jenkins didn’t have a single catch, Moss was largely forgotten in many games and Manningham had just 42 catches in 12 games, for 449 yards and one touchdown,before his season came to an early end when he tore a ligament in his left knee. Now, Manningham – who has been rehabbing the knee after surgery – says he may not be ready for the start of summer training camp. Appearing on Jim Rome’s national radio show this week, Manningham said he doesn’t want to rush his return because he wants to make certain he’s 100 percent before he resumes full football activities. That certainly isn’t news to Niners head coach Jim Harbaugh, who in February told reporters he didn’t believe Manningham would be ready by the start of camp. This season, however, the wide receiving corps of the 49ers appears much deeper. If Manningham wants to play a key role in 2013, he’ll likely need to be fit enough for the exhibition season to show he can be a big part of the receiving rotation that will feature starters Michael Crabtree and veteran pickup Anquan Boldin; Kyle Williams (who also is coming back from knee surgery); returners Jenkins and Ricardo Lockette; and fourth-round draft pick Quinton Patton. Quarterback B.J. Daniels of South Florida, a seventh-round pick, also may be used as a wideout. Manningham restructured the final year of his two-year deal with San Francisco in March to provide more room under the team’s salary cap, agreeing to reduce his 2013 base from $3.6 million to $1.8 million. Last season, Manningham had four games with a season-best five catches, but largely those receptions were for short yardage. His longest reception of the season went for 40 yards. 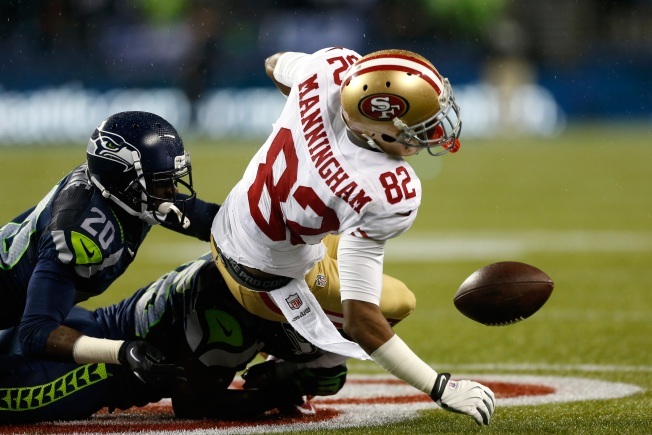 Now, Manningham is eager to get back and be a part of a 49ers team in 2013 that could be exciting offensively with quarterback Colin Kaepernick and some new receiving options.